Unlike stocks, each bond contract has unique characteristics that define how repayment will occur. Every bond contract has at least five components: the borrower, price, date of maturity, value of maturity and coupon rate. Every stock share of Whole Foods Market (WFM) is exactly like every other share. This makes pricing and making a market very easy. Bonds on the other hand have many other characteristics which make them unique. We focused on five, but in reality there are many more such as municipal, callable or secured. Also, most people don’t think that the price of individual bonds can fluctuate. They think so long as you hold the bond to maturity, the price should not fluctuate. This is not accurate. Imagine 5 years ago you purchased a 10-year bond with a $10,000 face value (value at maturity) and a 6% coupon rate. The company is a corporation with a stellar AAA rating. You have been receiving interest payment for 5 years by receiving a $300 payment every six months. Now even though the bond still has 5 years of payments before it matures you would like to sell it. You might think you could sell your bond for $10,000, but if you did, you would be losing money. 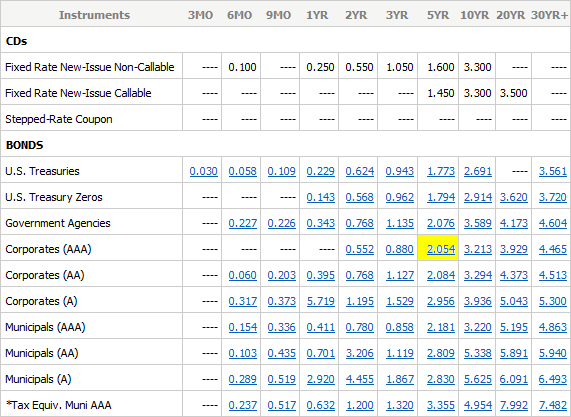 Other AAA bonds selling for $10,000 with 5-years remaining are only paying 2.054% interest while yours is paying 6%. You should be paid more because your bond pays $394.60 more each year for a cumulative total over the 4 years of an extra $1,973. Of course you aren’t willing to wait 5 years in order to get paid this extra money so you won’t be paid $11,973. You will only a portion of the interest now that you want to sell. Price for a 6.000% coupon bond: $11,854.49 + $300.00 semiannual coupon. Price for a 2.054% coupon bond: $10,000.00 + $102.70 semiannual coupon. Price for a 0.000% coupon bond: $9,028.7+ $0.00 semiannual coupon. Each of these choices has an expected yield of 2.054%. When interest rates rise, bond prices drop. And when interest rates drop, bond prices rise. your individual bond coupon looks better when interest rates drop and looks worse when they rise. Now imagine that I have purchased your bond. I paid $11,854.49 just to get the higher than currently normal coupon of $300 semiannually. As I hold the bond to maturity, the resale value of the bond will change. The value has to drop to $10,000 by the maturity date because that is all the money I am going to get. Many investors are not comfortable with purchasing a bond for more than the par (face) value knowing that it is guaranteed to lose capital over the course of its holding period. On the other hand a bond purchased below par value (because it is paying an inferior coupon rate) is guaranteed to appreciate over the course of its holding period. Some companies have a greater chance of going bankrupt and failing to pay bond holder everything that they are due. Ratings are, at best, wild guesses on the likelihood of getting paid back. This is why two corporations with the same poor rating (say BB) may have bond prices which are wildly different. For more on understanding the purpose of bonds in a portfolio, see “Portfolio Allocation: Risk-Return Mix“, “Appreciating Assets Part 1: Stocks and Bond“, and “How to Calculate An Advisor’s Value: Dynamic Withdrawals“. Should You Be Building Bond Ladders In This Lower Rate Environment?